The second issue of the new Review of Keynesian Economics is out, this one focused on growth. There’s a bunch of interesting contributions, but I especially like the piece by Steve Fazzari, Pietro Ferri, Edward Greenberg and Anna Maria Variato, on growth and aggregate demand. The starting point is the familiar puzzle that we have a clear short-run story in which changes in output  on the scale of the business cycle are determined by aggregate demand — that is, by changes in desired expenditure relative to income. But we don’t have a story about what role, if any, aggregate demand plays in the longer run. The dominant answer — unquestioned in the mainstream , but also widespread among heterodox writers — is, it doesn’t. Economic growth is supposed to depend on a different set of factors — technological change, population growth and capital accumulation — than those that influence demand in the short run. But it’s not obvious how you get from the short-run to the long — what mechanism, if any, that ensures that the various demand-driven fluctuations will converge to the long-run path dictated by these “fundamentals”? This is Harrod’s famous “knife-edge.” It’s been almost entirely displaced from the mainstream by Solow type growth models. Solow argued that the dynamic instability of Harrod’s model was due to the assumption of a fixed target capital-output ratio, and that the instability goes away if capital and labor are smoothly substitutible. In fact, Harrod makes no such assumption — his 1939 article explicitly considers the possibility that capitalists might target different capital-output ratios based on factors like interest rates. More generally, Solow didn’t resolve the problem of how short-run demand dynamics converge to the long-run supply-determined growth path, he just assumed it away. The old textbook solution was price flexibility. Demand constraints are supposed to only exist because prices are slow to adjust, so given enough time for prices to reach market-clearing levels, aggregate demand should cease to exist. The obvious problem with this, as Keynes already observed, is that while flexible prices may help to restore equilibrium in individual markets, they operate in the wrong direction for output as a whole. A severe demand shortfall tends to produce deflation, which further reduces demand for goods and services; similarly, excessive demand leads to inflation, which tends — though less certainly — to further increase demand. As Leijonhufvud notes, it’s a weird irony that sticky wages and/or prices are held to be the condition of effective demand failures, when the biggest demand failure of them all, the Depression, saw the sharpest falls in both wages and prices on record. The idea that if it just runs its course, deflation — via the real balance effect or some such — will eventually restore full employment is too much even for most economists to swallow. So the new consensus replaces price level adjustment with central bank following a policy rule. In textbooks, this is glossed as just hastening an adjustment that would have happened on its own via the price level, but that’s obviously backward. When an economy actually does develop high inflation or deflation, central banks consider their jobs more urgent, not less so. It’s worth pausing a moment to think about this. While the central bank policy rule is blandly presented as just another equation in a macroeconomic model, the implications are actually quite radical. Making monetary policy the sole mechanism by which the economy converges to full employment (or the NAIRU) implicitly concedes that on its own, the capitalist economy is fundamentally unstable. While the question of how, or whether, aggregate demand dynamics converge to a long-run growth path has been ignored or papered over by the mainstream, it gets plenty of attention from heterodox macro. Even in this one issue of ROKE, there are several articles that engage with it in one way or another. The usual answer, among those who do at least ask the question, is that the knife-edge result must be wrong, and indicates some flaw in the way Harrod posed the problem. After all, in real-world capitalist economies, output appears only moderately unstable. Many different adjustments have been proposed to his model to make demand converge to a stable path. Fazzari et al.’s answer to the puzzle, which I personally find persuasive, is that demand dynamics really are that unstable — that taken on their own the positive feedbacks between income, expenditure and investment would cause output to spiral toward infinity or fall to zero. The reasons this doesn’t happen is because of the ceiling imposed by supply constraints and the the floor set by autonomous expenditure (government spending, long-term investment, exports, etc.). But in general, the level of output is set by expenditure, and there is no reason to expect desired expenditure to converge to exactly full utilization of the economy’s resources. When rising demand hits supply constraints, it can’t settle at full employment, since in general full employment is only reached on the (unfulfillable) expectation of more-than-full employment. Upward demand instability can drive demand to a level that fully employs labor resources. 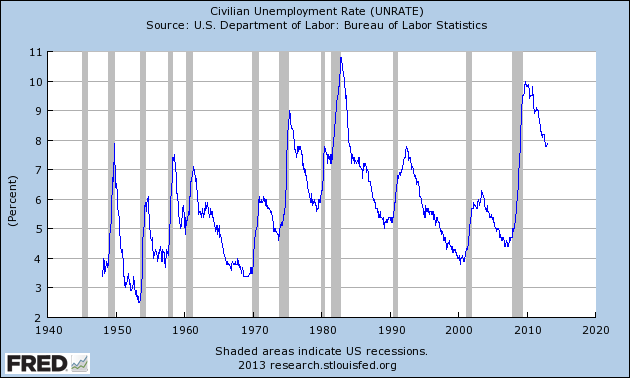 But the full employment path is not stable. … The system bounces off the ceiling onto an unstable declining growth path. I won’t go through the math, which in any case isn’t complicated — is trivial, even, by the standards of “real” economics papers. The key assumptions are just a sufficiently strong link between income and consumption, and a target capital output ratio, which investment is set to maintain. These two assumptions together define the multiplier-accelerator model; because Fazzari et al explicitly incorporate short-term expectations, they need a third assumption, that unexpected changes in output growth cause expectations of future growth to adjust in the same direction — in other words, if growth is higher than expected this period, people adjust their estimates of next period’s growth upward. These three assumptions, regardless of specific parameter values, are enough to yield dynamic instability, where any deviation from the unique stable growth path tends to amplify over time. The formal model here is not new. What’s more unusual is Fazzari et al.’s suggestion that this really is how capitalist economies behave. The great majority of the time, output is governed only by aggregate demand, and demand is either accelerating or decelerating. Only the existence of expenditure not linked to market income prevents output from falling to zero in recessions; supply constraints — the productive capacity of the economy — matters only occasionally, at the peaks of businesses cycles. So: why do I like this paper so much? Second, I like the argument that output is demand-constrained at almost all times. There is no equilibrium between “aggregate supply” and “aggregate demand”; rather, under normal conditions the supply side doesn’t play any role at all. Except for World War II, basically, supply constraints only come into play momentarily at the top of expansions, and not in the form of some kind of equilibration via prices, but as a more or less violent external interruption in the dynamics of aggregate demand. It is more or less always true, that if you ask why is output higher than it was last period, the answer is that someone decided to increase their expenditure. Fourth, I like the paper’s notion of economies having different regimes, some of persistently excess demand, some persistent demand shortfalls. When I was talking about this paper with Arjun the other day he asked, very sensibly, what’s the relevance to our current situation. My first response was not much, it’s more theoretical. But it occurs to me now that the mainstream model (often implicit) of fluctuations around a supply-determined growth path is actually quite important to liberal ideas about fiscal policy. The idea that a deep recession now will be balanced by a big boom sometime in the future underwrites the idea that short-run stimulus should be combined with a commitment to long-run austerity. If, on the other hand, you think that the fundamental parameters of an economy can lead to demand either falling persistently behind, or running persistently ahead, of supply constraints, then you are more likely to think that a deep recession is a sign that fiscal policy is secularly too tight (or investment secularly too low, etc.) So the current relevance of the Fazzari paper is that if you prefer their vision to the mainstream’s, you are more likely to see the need for bigger deficits today as evidence of a need for bigger deficits forever. Finally, on a more meta level, I share the implicit vision of capitalism not as a single system in (or perhaps out of) equilibrium, but involving a number of independent processes which sometimes happen to behave consistently with each other and sometimes don’t. In the Harrod story, it’s demand-driven output and the productive capacity of the economy, and population growth in particular; one could tell the same story about trade flows and financial flows, or about fixed costs and the degree of monopoly (as Bruce Wilder and I were discussing in comments). Or perhaps borrowing and interest rates. In all cases these are two distinct causal systems, which interact in various ways but are not automatically balanced by any kind of price or equivalent mechanism. The different systems may happen to move together in a way that facilitates smooth growth; or they may move inconsistently, which will bring various buffers into play and, when these are exhausted, lead to some kind of crisis whose resolution lies outside the model. A few points, not so much of criticism, as suggestions for further development. First, a minor point — the assumption that expectations adjust in the same direction as errors is a bit trickier than they acknowledge. I think it’s entirely reasonable here, but it’s clearly not always valid and the domain over which it applies isn’t obvious. If for instance the evolution of output is believed to follow a process like yt = c + alpha t + et, then unusually high growth in one period would lead to expectations of lower growth in the next period, not higher as Fazzari et al assume. And of course to the extent that such expectations would tend to stabilize the path of output, they would be self-fulfilling. (In other words, widespread belief in the mainstream view of growth will actually make the mainstream view more true — though evidently not true enough.) As I say, I don’t think it’s a problem here, but the existence of both kinds of expectations is important. The classic historical example is the gold standard: Before WWI, when there was a strong expectation that the gold link would be maintained, a fall in a country’s currency would lead to expectations of subsequent appreciation, which produced a capital inflow that in fact led to the appreciation; whereas after the war, when devaluations seemed more likely, speculative capital flows tended to be destabilizing. Two more substantive points concern supply constraints. I think it’s a strength, not a weakness of the paper that it doesn’t try to represent supply constraints in any systematic way, but just leaves them exogenous. Models are tools for logical argument, not toy train sets; the goal is to clarify a particular set of causal relationships, not to construct a miniature replica of the whole economy. Still, there are a couple issues around the relationship between rising demand and supply constraints that one would like to develop further. First, what concretely happens when aggregate expenditure exceeds supply? It’s not enough to just say “it can’t,” in part because expenditure is in dollar terms while supply constraints represent real physical or sociological limits. As Fazzari et al. acknowledge, we need some Marx with our Keynes here — we need to bring in falling profits as a key channel by which supply constraints bind. As potential output is approached, there’s an increase in the share claimed by inelastically-supplied factors, especially labor, and a fall in the share going to capital. This is the classic Marxian cyclical profit squeeze, though in recent cycles it may be the rents claimed by suppliers of oil and “land” in general, as opposed to wages, that is doing much of the squeezing. But in any case, a natural next step for this work would be to give a more concrete account of the mechanisms by which supply constraints bind. This will also help clarify why the transitions from expansion to recession are so much more abrupt than the transitions the other way. (Just as there are no mini-recessions, neither are there anti-crises.) The pure demand story explains why output cannot rise stably on the full employment trajectory, but must either rise faster or else fall; but on its own it’s essentially symmetrical and can’t explain why recessions are so much steeper and shorter than expansions. Minsky-type dynamics, where a fall in output means financial commitments cannot be met, must also play a role here. while in our simple model the supply-side path is assumed exogenous, it is easy to posit realistic economic channels through which the actual demand-determined performance of the economy away from full employment affects conditions of supply. The quantity and productivity of labor and capital at occasional business-cycle peaks will likely depend on the demand-determined performance of the economy in the normal case in which the system is below full employment. I think this is right, and a very important point to develop. There is increasing recognition in the mainstream of the importance of hysteresis — the negative effects on economic potential of prolonged unemployment. There’s little or no discussion of anti-hysteresis — the possibility that inflationary booms have long-term positive effects on aggregate supply. But I think it would be easy to defend the argument that a disproportionate share of innovation, new investment and laborforce broadening happens in periods when demand is persistently pushing against potential. In either case, the conventional relationship between demand and supply is reversed — in a world where (anti-)hysteresis is important, “excessive” demand may lead to only temporarily higher inflation but permanently higher employment and output, and conversely. Finally, obsessive that I am, I’d like to link this argument to Leijonhufvud’s notion of a “corridor of stability” in capitalist economies, which — though Leijonhufvud isn’t cited — this article could be seen as a natural development of. His corridor is different from this one, though — it refers to the relative stability of growth between crises. The key factor in maintaining that stability is the weakness of the link between income and expenditure as long as changes in income remain small. Within some limits, changes in the income of households and firms do not cause them to revise their beliefs about future income (expectations are normally fairly inelastic), and can be buffered by stocks of liquid assets and the credit system. Only when income diverges too far from its prior trajectory do expectations change — often discontinuously — and, if the divergence is downward, do credit constraints being to bind. If it weren’t for these stabilizing factors, capitalist growth would always, and not just occasionally, take the form of explosive bubbles. Combining Leijonhufvud and Fazzari et al., we could envision the capitalist growth path passing through concentric bands of stability and instability. The innermost band is Leijonhufvud’s corridor, where the income-expenditure link is weak. Outside of that is the band of Harrodian instability, where expectations are adjusting and credit constraints bind. That normal limits of that band are set, at least over most of the postwar era, by active stabilization measures by the state, meaning in recent decades monetary policy. (The signature of this is that recoveries from recessions are very rapid.) Beyond this is the broader zone of instability described by the Fazzari paper — though keeping the 1930s in mind, we might emphasize the zero lower bound on gross investment a bit more, and autonomous spending less, in setting the floor of this band. And beyond that must be a final zone of instability where the system blows itself to pieces. Bottom line: If heterodox macroeconomic theory is going to move away from pure critique (and it really needs to) and focus on developing a positive alternative to the mainstream, articles like this are a very good start. It’s unfortunate that no effort has been made to make ROKE content available online. Since neither of the universities I’m affiliated with has a subscription yet, it’s literally impossible for me — and presumably you — to see most of the articles. I imagine this is a common problem for new journals. When I raised this issue with one of the editors, and asked if they’d considered an open-access model, he dismissed the idea and suggested I buy a subscription — hey, it’s only $80 for students. I admit this annoyed me some. Isn’t it self-defeating to go to the effort of starting a new journal and solicit lots of great work for it, and then shrug off responsibility for ensuring that people can actually read it? It’s not a straightforward question what exactly is growing in economic growth. When I talk about demand dynamics, I prefer to use the generic term “activity,” as proxied by a variety of measures like GDP, employment, capacity utilization, etc. (This is also how NBER business-cycle dating works.) But here I’ll follow Fazzari et al. and talk about output, presumably the stuff measured by GDP. Forecasters, no matter where they think that potential GDP line might be, all believe actual GDP will eventually move back to it. “Output gaps”—the shaded area representing the cumulative miss of actual GDP relative to its potential—simply won’t last forever. And if that means GDP growth has to accelerate in the future (as it does when GDP today is below its potential)—well, that’s just the way it is. Here we have the consensus with no hedging. Everyone knows that long-run growth is independent of aggregate demand, so slower growth today means faster growth tomorrow. That’s “nature,” that’s just the way it is. The basic idea of overaccumulation is that capitalism sometimes generates a higher rate of accumulation than can be sustained, and thus the rate of accumulation has eventually to fall. Towards the end of the postwar boom, an imbalance between accumulation and the labor supply led to increasingly severe labor shortage. … Real wages were pulled up and older machines rendered unprofitable, allowing a faster transfer of workers to new machines. This could in principle have occurred smoothly: as profitability slid down, accumulation could have declined gently to a sustainable rate. but the capitalist system has no mechanism guaranteeing a smooth transition in such circumstances. In the late sixties the initial effect of overaccumulation was a period of feverish growth with rapidly rising wages and prices and an enthusiasm for get-rich-quick schemes. These temporarily masked, but could not suppress, the deterioration in profitability. Confidence was undermined, investment collapsed and a spectacular crash occurred. Overaccumulation gave rise, not to a mild decline in the profit rate, but to a classic capitalist crisis. I think the Marxist framework here, with its focus on profit rates, complements rather than contradicts the Keynesian frame of Fazzari et al. and its focus on demand. In particular, the concrete mechanisms by which supply constraints operate are much clearer here. The way the price of scientific papers is set now is stupid. Subscriptions to the journals are prohibitively costly (maybe if you're a tenured professor in the USA, it is feasible, but imagine yourself as a young postgraduate in Russia who gets like 150$ a month from the government! ), and the individual papers in JSTOR are overpriced. There are 30$ papers that are barely 10-page long. I think the main problem is that there is no price differentiation. It is obvious that there are really two classes of buyers in this market: first, universities, which buy subscriptions almost regardless of cost, and solitary enthusiasts who do not have ready access to uni's resources. Right now they have a choice of either not reading scientific papers, cutting back on their food and other spending to buy a very limited number of papers, or – the sensible but illegal choice – accessing papers through the proxies. I think it would be better for everyone involved if academic journals were sold to the universities as before, but everyone willing to read a paper online was able to do so for a microtransaction or even viewing an ad. That would be ok but even better, just make them free. There are plenty of other ways the same flow of resources from universities to journals can take place beside subscriptions. You mean something like grants? I don't think it will really work if those transfers are voluntary. A lot of universities will try to get away with paying nothing, if they can do so. But if they had a choice between paying the microtransactions or buying subscription, they'd choose the second option even if the costs were equal. I tried to discuss (personal) income distribution in the context of the Harrod=Domar model here: http://robertvienneau.blogspot.com/2010/08/why-income-equality-leads-to.html. I think the regime I consider, with the warranted rate below the natural rate, may be helpful in analyzing the USA in the decades after the collapse of Bretton Woods. 1. In all fairness to "mainstream" economics, it is more or less consensus that output follows a stochastic trend and not a deterministic trend. This is different than the story that gets presented on blogs/policy discussions and it is assumed that the stochastic process is driven by the supply side, but none the less, output is treated as a stochastic trend in mainstream empirical and theoretical work. As well, most comparisons of potential and actual output produced by "mainstream" economists (CEA forecasts, for instance) usually show actual output as fluctuating below potential the vast majority of the time. 2. WWII is not the only instance we see the economy move above potential. In the post war we also saw output above potential from 66-68 when peak war spending bumped up against an already booming economy and also from around 2004-2006 we saw output above potential. There are probably other instances but those two jump out. 3. I think you are discounting the role of consumption smoothing in mitigating business cycles. While I do think government spending is a significant cushion its not obvious that on average post war business cycles (ignoring GD) have been that much more tame than prewar recessions. I'm not 100% sure I buy that they are less tame, but again, just bringing it up as a counterpoint. Anyway, good post, and thanks for bring attention to this paper. On 1, I think I would characterize the state of the mainstream a bit differently. i think the theroetical commitment to a fundamentals-driven long run trend is quite strong. So the evidence — is it really a consensus? — that there is a large permanent component of short-run output movements is treated by RBC types as evidence that demand doesn't matter even in the short run. For the New Keynesian mainstream, this evidence is an anomaly that on some level must reflect a measurement error of some kind. The theoretical commitment that demand drives business cycle-frequency fluctuations but is irrelevant for growth, doesn't leave any other possibility. 2. I thought about mentioning the late '60s in the post — Fazzari et al. give it as another possible example, though not unambiguous. I don't agree about the 2000s — output may have been above some standard measure of potential then but I think that's an artifact of the way potential is measured and not a sign that any genuine supply constraints were being reached. 3. I think of consumption smoothing as being mainly part of the innermost band of demand dynamics, Leijonhufvud's corridor of stability. Once a fluctuations in income gets big enough for households' and firms' expectations of future income to adjust, and credit constraints to bind, expenditure and income get much more closely linked. (One important difference in this perspective is there is no "true" expected value of future income for people to know.) That said, one could certainly argue that the development of household credit has extended the range over which income and consumption are only weakly linked. I would have a hard time being convinced that prewar business cycles weren't significantly more violent than postwar ones — or that there's any good reason to exclude the Depression from the prewar sample. I'm probably going to embarrass myself here but I'll risk it. What else are econ blogs good for for except asking potentially silly questions? Here goes. In the Fazzari et al paper, on page 11 they say "We assume that investment in period t becomes effective in period t+1." But their equation 2.4 has "K(t)=K(t−1)(1−δ)+I(t)" – which is investment in period t becoming effective in period t. Shouldn't that be I(t-1)? In fact, assuming that equation 2.3 is correct, that's the only way you can get equation 2.5. Right? Ok but that's just a typo. More substantially I think there's some confusion with regards to the expectations operator. As in "when are the expectations formed" and "for which period". Eg(t) is the expectation formed at time t-1 for the growth in income between t-1 and t; essentially the expectation at time t-1 for what income will be in period t.
rather than having v*(1+Eg(t))^2 on the left hand side. So when you take the derivative… it's different. Anyway, it probably works anyway.